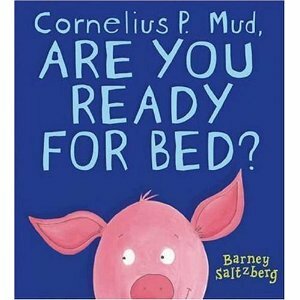 Project 365: Perfect Picture Book Friday – Cornelius P. Mud, Are You Ready For Bed? Mastering tasks and skills, bedtime routines and father­-son relationships. It’s bedtime at the Mud household. Cornelius’ father asks if he is ready for bed. Cornelius answers “yes” to each of his father’s questions. Did you put your pajamas on? Did you feed your fish? Did you brush your teeth? The hilarious illustrations reveal that Cornelius and his father have different ideas about what constitutes getting ready for bed. Should he really be feeding his fish chocolate chip cookies? And wait till you see what he puts on his toothbrush. (Hint: it’s NOT toothpaste) But the most important thing Cornelius needs to remember is that his father truly loves him. This is a story that every parent and child can relate to. Many parents have trouble establishing bedtime routines. And most young children LOVE to procrastinate and put off going to bed. During my Show Me How Story-time programs, the kindergarten children can’t wait to talk about what is wrong with Cornelius’ pajama choice. They love counting the pile of books that Cornelius has chosen for his father to read…nineteen! And they gasp with horror as they watch Cornelius put chocolate chip cookies in the fish bowl. The book is funny and a joy to read and listen to…but it also encourages children to think about what activities they need to perform as they get ready for their own bedtimes while sending a beautiful message about a father’s love for his son. 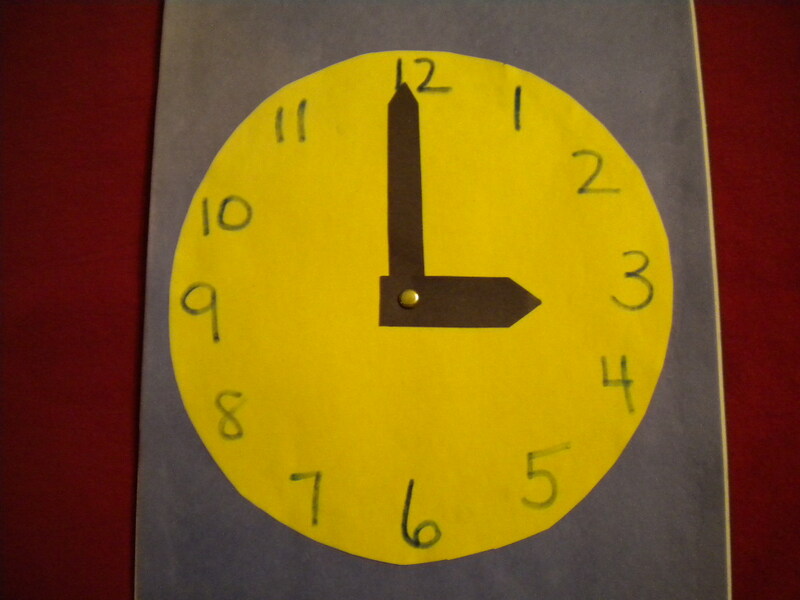 Telling time is an important skill that young children need to learn…even in these days of digital clocks. Here is a simple clock with movable hands that a young child can make and set to a special time…lunchtime, playdate time or bedtime. You will need: 1 dark piece of construction paper, 1 circle cut from light construction paper (about 6 inches in diameter), 1 metal paper fastener, 2 “hands” cut from dark construction paper, marker or crayon, glue stick. 1. Poke a hole in the center of the construction paper circle. 2. Write the numbers in the correct order around the inside edge of the circle…draw the 12, 3, 6 and 9 first…then fill in the other numbers. If the children are doing the numbers themselves, this will help them leave enough space for the rest of the numbers. 3. Glue the circle onto the center of the larger piece of construction paper. 4. Poke through the center hole and also the two “hands” and attach the hands with the metal paper fastener. The hands should be able to turn. This entry was posted in children's picture books, Crafting with Children, Perfect Picture Book Friday and tagged Barney Saltzman, Bedtime, children, Cornelius P. Mud are You Ready for Bed?, Father-son love, Picture book by viviankirkfield. Bookmark the permalink. Sounds like a cute story. It’s very late, Nancy…yes, you should be in bed. 🙂 And me, too! Oh, I remember that book, and Cornelius P. Mud, are you ready for school? We haven’t read them in a long time, but I think I’ll get them from the library again because we need the reminders. My five year old is the worst procrastinator in the world so maybe we’ll make a little fun out of it and show him someone who may be even worse! The kindergarten and Pre-K kids at school absolutely LOVED the book…couldn’t wait to tell me what was “wrong” with each picture. And when we got to the page where Cornelius was brushing his teeth with a soap filled body brush, they almost rolled on the floor. I love this book..my daughter is 17 now. Either way I did not have that routine thing as I raised her as a single mom. But I wish I could have read this and did it back then. Mom’s today need a routine. Parenting is such a difficult job…and single parenting makes the task exponentially harder. You should be so proud of yourself for what you’ve done! But I believe you are right…routines do help make life run more smoothly…and most kids love them and feel less stressed because they know what to expect. I can just imagine kids roaring with laughter as they listen to this book! Sounds like a great way for kids to participate in the action of the book. What a fun selection. It is a very interactive book, Pat. And kids really can relate to Cornelius’ idea of putting his toys away (by stuffing them in the closet) and all the other over-the-top hilarious ways he gets ready for bed. I love this PPBF of Susannah…I’m so thankful I found my way to her and to all of you. These are the kind of books that make me so sad I am not an illustrator. I love books where the text says one thing and the illustrations say another, but hard to pull off if you are an author-only. I know. 🙂 I love being creative with kids…doing all types of crafty things…but an illustrator I definitely am not! I am in awe of people who can take an idea and render it into a picture that is a work of art. This book sounds terrific! I haven’t read it yet, but I think I must 🙂 I love that it has a father/son relationship – we don’t have any of those on the list yet , all father/daughter, so thanks for that! I also like the mastering skills aspect. The activities look fun, too! So glad you like this selection. Kids really love the story and totally relate to it. This book sounds great! The kids seeing the variants between what Cornelius is saying and what he is doing would not only make for hilarity, but would get a point across in a very fun way. Great activities, too. So glad you liked the selection…you’re right…kids want to hear it again and again…and each time they see more details in the illustrations that add to the humor. Hmm. Now I’m curious about the toothpaste substitute. I love that the illustrations and story work so well together. TeeHee, Stacy, you will just have to read it. 🙂 I know you will love it! I love the sound of this book. Thank you for posting about it. Thanks for stopping by. I loved your post on having no time to write. I have the same problem…part of my problem is the time it takes to read other people’s blogs (which I love to do and learn so much from) and then comment and also comment on the comments that people make on my posts. And it takes time to write the posts as well. And that doesn’t count household chores and shopping and…. I guess one has to set aside a certain block of time, be it an hour or more or less…and stick to it and make it a habit and a routine and just write! This sounds like a great book and I can imagine all the kids laughing out loud when they see the pictures. I love your craft ideas…. on reading your comments it reminds me to take a mental note on coming up with craft ideas to use with kids when visiting schools…. (when I am published of course). excellent thanks for posting. I’ve always loved using picture books for the daily theme in my kindergarten classes, daycare groups and with my own children…and then coming up with related crafts and other acitivities to round out the day. For me, and for them, it’s been so much fun! Oh, this book sounds adorable and fun! I’ll have to check it out. Thanks for sharing it. Kids really love the hilarious way Cornelius gets ready for bed…they can definitely relate to it! This book sounds great! I love PB’s that have humor. Great review! Thanks for coming by, Loni. I also love books with humor…and kids do as well! What a darling concept! Sadly, it looks like it’s out of print, or at least not currently available on Amazon (I have no English library here). I don’t know about the pig, but if it were me, I would be putting chocolate on my toothbrush. Now that’s a flavor I would LOVE! I know the book is available on Half.com for 75 cents (good condition, ex-library) but I don’t know what their shipping is for out of the United States. It is a hilarious book…and kids love it so much because they can really relate to Cornelius’ antics. I’m loving Susannah’s PPBF…I am meeting the most wonderful people!